We undertook this audit because workers’ compensation poses inherent risks, such as employees filing claims for nonoccupational injuries, health care providers billing for services not rendered, and employers failing to provide return-to-work options. Workers’ compensation costs were higher than the national average for state and local governments.The city paid $44.4 million in workers’ compensation expenses from July 2009 through March 2013. Cost was equivalent to about $1,681 per full-time equivalent employee, about 58% higher than the average for state and local governments. 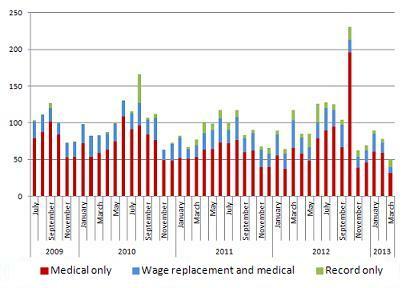 Workers’ compensation costs have remained relatively consistent since 2009. Although the Office of Enterprise Risk Management has a goal of reducing workers’ compensation costs, the cost per year has remained relatively flat. The number of claims was more than double the national average for local governments. City employees filed 4,376 workers’ compensation claims from July 2009 through March 2013. These claims averaged to 14.7 per 100 full-time employees per year in contrast to 6.1 occupational injuries and illnesses per 100 employees during 2011 reported in the 2012 Bureau of Labor Statistics survey. Four departments account for the majority of workers’ compensation claims. Employees from the police department, public works, watershed management, and the fire department filed 84% of workers’ compensation claims from fiscal year 2010 through March 2013. The highest number of claims was filed by employees in their first year of employment. The number of repeat claimants was high. About 57% of claims were filed by employees who filed more than one claim during the 45 months we reviewed.